Equipped with a most impressive-looking 7-inch tablet screen, a long battery life and considering its obvious portability, the Amazon Kindle Fire HD is really a top-notch on-the-go entertainment device for browsing, playing, reading outdoors. There are several ways for you to transfer a variety of content from a Windows or Mac computer to your Kindle Fire HD. Here I will throw up three methods to transfer music, photos and videos to your Kindle Fire HD Tablet, you can pick the method that's best for you. You can transfer content files from a Windows or Mac computer to your Kindle Fire HD device, including books, music, video, photos, and documents, using the USB cable that came with your Kindle. Both Macintosh and Windows users can download and transfer compatible content files from a computer to Kindle Fire HD device using a compatible USB cable. When your Kindle Fire is plugged into your computer, it will appear as a removable mass-storage device. This method is highly recommended. * Windows-based: Windows Vista or later. Windows XP users may be required to update their copy of Windows Media Player. Visit the USB Transfer Tools page for details. * Macintosh: Mac OS X 10.5 or later. Note: Mac users need to install a free app, Android File Transfer, to complete a USB transfer. Visit android.com/filetransfer and follow the onscreen instructions. * USB port: An available port or an attached USB hub with an available port. 1. Connect Kindle Fire HD to your PC via USB. 2. Once you've connected your Kindle Fire HD to a computer with a USB cable (sold separately), your Kindle Fire HD will appear in the same location as external USB drives usually appear. For Windows users, this is typically in the "Computer" or "My Computer" menu. 3. Open the Kindle drive; you will see several folders inside. You may need to unlock your Kindle Fire HD before it can be opened on your computer. 4. Locate the downloaded file and drag and drop it into the applicable content folder, such as Video, Music, or Pictures. 5. Safely eject your Kindle Fire HD from your computer and unplug the USB cable. ●Books will appear in the Books library. ●Personal documents will appear in the Docs library. ●Music will appear in the Music library. ●Pictures will appear in the Gallery app. ●Videos will appear in the Gallery app. Note that videos transferred via USB will only be available in the Gallery app. Only videos from the Amazon Video store are shown in the Video library. Your content libraries -- like Apps, Books, and Games -- include content that’s available both in the Amazon Cloud and content you’ve downloaded to your device. You can choose to access your content through the Cloud while your Kindle Fire HD is connected via Wi-Fi, or to download your content to your device for easy access even when your device isn't connected wirelessly. Confirm that your Kindle Fire HD is connected to Wi-Fi. 1. Tap the Cloud tab within the Games, Apps, Books, Music, Videos, Newsstand, Audiobooks, Photos, or Docs libraries. 2. Tap an item in the Cloud to download it to your Device tab. Manage and sync your iTunes music, photos and videos with this popular and lightweight software. It's easy to use and completely free. Also supports wireless sync with the Air Sync client ($4.99 on Google Play). This method not only syncs your media, but also your playlists and track ratings. Requirements: Visit doubletwist.com for additional details. 1. Download DoubleTwist from Google Play on your Kindle Fire HD. 2. On your computer (PC or Mac), use your browser to go to doubletwist.com, and use the link to download DoubleTwist. Follow the installation instructions. 3. Follow the instructions on the app on your device and the computer to set up synchronization between DoubleTwist on your computer and Amazon Tablet. P.S. You can visit Amazon Help - Transferring & Downloading Content to Your Kindle Fire HD to learn more transferring methods. Better Put Kindle Fire HD friendly videos to the device. If you've got the Kindle Fire HD specs, you will get to know that Kindle Fire HD video format is limited to MP4, 3GP, VP8(.webm). 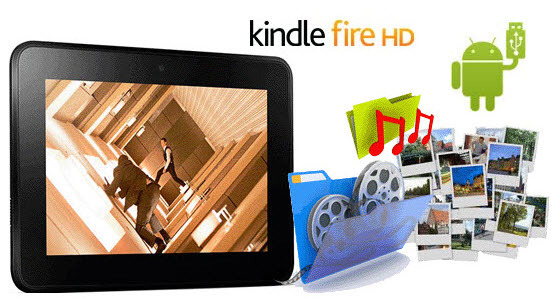 Thus, if you want to copy videos to Kindle Fire HD in other formats like MKV, WMV, AVI, FLV, MTS, M2TS, MOV, MPEG, MPG, MOD, TiVo, VOB, etc, you will need reformat these video files first. You can try this professional Kindle Fire HD Video Converter to batch convert videos in various formats up to 1080p to the Fire HD playable format (e.g. MP4). Don't put copy-protected contents onto the Kindle Fire HD Tablet. Movies purchased or downloaded from online (e.g. iTunes, BBC iPlayer) are restricted to specific computers and devices only. Unfortunately the Android devices have not get a license to play DRM contents which means Kindle Fire HD is not granted to play DRM-protected videos. To have the device play these movie purchases, get yourself a DRM removal tool first (e.g. ChewTune). 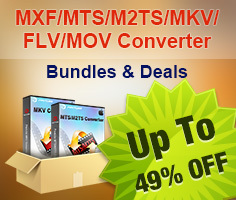 Compress/convert your HD videos when necessary. By necessary I mean when the Amazon Tablet pops up an error message saying unsupported file or plays video in slow motion. If you have the intention to transfer Blu-ray, DVD movies as well as your personal HD video files to Kindle Fire HD, you'd better get the best all-in-one video convert tool Blu-ray Video Converter Ultimate to have fastest and most effective conversion.